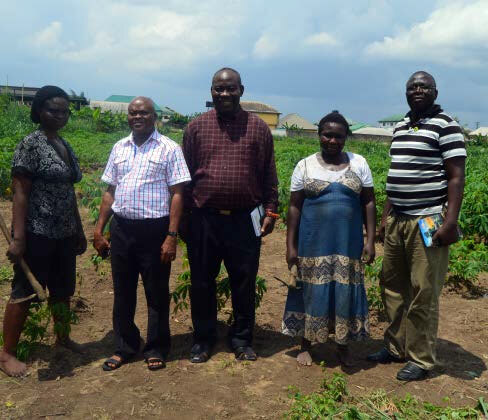 Dr Okechukwu Richardson (second from left) and Mr Francis Adunoye (third from left) of IITA visiting with Ministry of Agriculture officials. The IITA station at Onne, Rivers State, Nigeria, has received nods of approval from three more reputable government agencies in its host state. These are the Rivers State Ministry of Agriculture, Rivers State Agricultural Development Program (ADP), and the state School to Land Authority project. These institutions have also agreed to partner with IITA to move agriculture forward. Receiving the IITA delegation led by Richardson Okechukwu, Head, IITA Onne, to their offices on 29 June, representatives from the agencies confirmed that the revival of operations at the Onne station was timely and that working together, the cooperation with IITA would produce a positive multiplier effect on the state’s economy. They also praised IITA’s efforts in rejuvenating agriculture in Nigeria and expressed optimism that the South-South region will partake in the transformation. “I have known IITA Onne as far back as 1985 when it was booming. I’m happy the station is refocused now and we are ready to partner with IITA,” stated Adolphus Nweke, Permanent Secretary, Rivers State Ministry of Agriculture. Similarly, Atuzie, Program Manager of ADP, expressed the hope that the renewed Onne station will continue to benefit the people of Rivers State just as it did in the past with the joint work with the ADP on the Integrated Cassava Project from 2003 to 2008. On his part, Okechukwu recalled the station’s partnership with the State government in promoting better livelihoods for farmers through the Green River project sponsored by AGIP, SONGHAI, and other extension service institutions. He implored the institutions to leverage on the Institute’s services and establish research fields which will be beneficial for the farmers in the State. “IITA Onne is a center for plantain, banana, cassava, maize, rice, yam, soybean, and cowpea research. Plantain/banana and cassava have taken the leap forward in the station at the moment. In due course, we will reignite research on the other crops. The station is now working towards attracting more investors and partners as we move forward,” Okechukwu explained. The IITA team also received a briefing from Vincent Amaiye, Executive Director, School to Land Authority, about its work on livestock farming, fishery crop production, and processing. The visit was wrapped up with a tour around the facilities of the institutions.